Don’t miss the final stop of this unstoppable artist-explorer that brilliantly captured the West! Adventure and art! Stanley traveled more than 8,000 miles crisscrossing the western territories in the mid-1800s, venturing as far as the kingdom of Hawaii. This prolific painter lost most of his works to a series of disasters including a fire at the Smithsonian where more than 200 of his Indian Gallery works burned. As the official artist with Isaac Stevens’ railroad survey expedition in 1853, Stanley’s sketches helped chart the course for the Northern Pacific Railway—which connected Tacoma to the Great Lakes and greatly contributed to the development of our region. See 60 of Stanley’s key surviving works in this first-ever retrospective. Painted Journeys: The Art of John Mix Stanley is organized by the Buffalo Bill Center of the West, Cody, Wyoming. Funding support generously provided by: Anson M. Beard, Jr., Christie’s, The Family of Helga and Erivan Haub, The Herndon Foundation, Gerald Peters Family Foundation, Donald L. King Trust, Mrs. J. Maxwell Moran, Ranney and Terri Moran, National Endowment for the Arts, William B. Ruger, Jr., Mary A. H. Rumsey Foundation, John and Meredith Sullivan, Naoma Tate and the Family of Hal Tate, TEX-OK Energy, in honor of Glenn E. Nielson’s many contributions to the Cody community, Mr. and Mrs. William D. Weiss, Lisa and William M. Wirthlin, Jr., and Wyoming Arts Council. 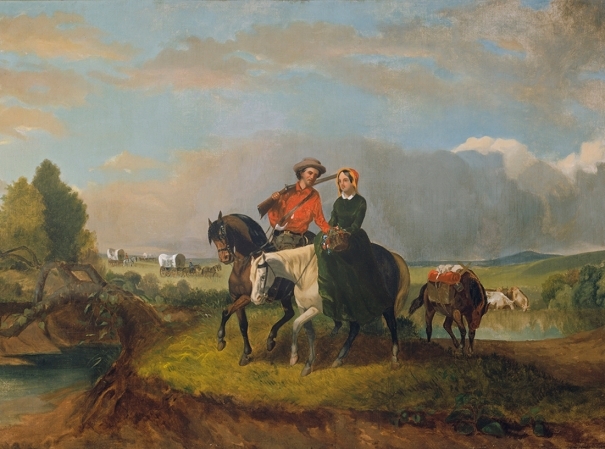 Painted Journeys: The Art of John Mix Stanley is generously supported by ArtsFund (logo), the Tacoma Arts Commission (logo), and Patriot Fire Protection Inc.
Top: John Mix Stanley (American, 1814‑1872), Wagon Train Break in the Journey, circa 1855. Oil on canvas. 30 × 44 inches. American Museum of Western Art—the Anschutz Collection, Denver, Colorado. Right: John Mix Stanley (American, 1814‑1872), Self-Portrait (detail), circa 1860. Oil on canvas. Gilcrease Museum, Tulsa, Oklahoma. L.394.2015.6 (0126.1139).